August! Already!? Spring is almost here…..This month we are giving away a mini apple pie moonshine & some nuts. So as usual when you spend $50 or more in the shop you will go into the draw to win. 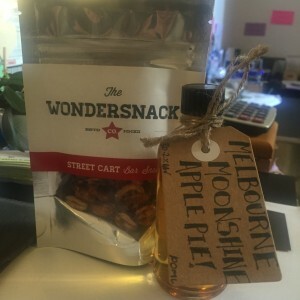 The prize consists of 1 x 100ml Melbourne Moonshine Apple Pie & 1 x Packet of Wondersnack Street Cart nuts to snack on! The winner will be drawn on the 1st of September, so get your entries in quick. CONGRATULATION! Hannah Metcher….You are the winner of this months prize!